The early symptoms of the disease appear from the latter half of June to the middle of July when the leaves on one or more branches may wilt, droop and curl. The leaves then turn brown and usually remain on the tree. 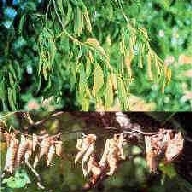 Since other diseases like Dothiorella Elm Wilt can cause symptoms similar to those of DED, positive identification requires a laboratory test. Please report any suspected Dutch elm disease problems on private or public elm trees to 311 or treebugs@edmonton.ca.